This past saturday the Hops Alchemy gang got together for a double brew day! We are still learning a lot so we are still using liquid malt extract (LME) kits. This brew event featured a Red Ale by Brewers Best and a Brown Ale by Midwset. The day started out in a pretty haphazard way. I couldn't find the lid to my fermentation bucket. I searched all over the garage but couldn't find it until I went to the basement to get my kettle and I saw the last batch we bottled patiently carbonating on the shelves. We had potentially overfilled four bottles and I had put them in a second bucket with my fermentation lid on it just in case they blew. The bottles were fine so I took them and the lid upstairs along with the kettle. Once upstairs Mike and his cousin Jason showed up with the Brown Ale kit, some tools, and a case of assorted beer along with a collection of bottles from the Fat Tire clone (Flat Tire) we had recently made. They did not, however, bring a kettle or their burner. I noticed the missing burner so sent them back around the blocks to Mikes to get it. I searched all over for my second kettle but couldn't find it so then they had to go back again to get their kettle. At least I had a nice new full propane tank for them to use! The next arrival was Derrick and his family along with some really high gravity beers for us to drink while we brewed. Derrick is a biochemist and he has offered to measure our IBUs in the future. I'm pretty stoked to discover this capability in the group! Our final arrivals were Jason and his girlfriend Lindsay and we were ready to get to brewing. We setup both boiling stations in the garage close to the door. I normally would brew in my backyard when the weather is as nice as it was on Saturday but my patio (that I installed) isn't that level and I really only have on great place to put a boiler out there so we set up in the garage and just kept the door open through the day. We started drinking right away which, honestly, wasn't the smartest plan. We were sharing each bottle so we can each sample all of the beers we had brought or that I already had there. By the end of the day we had each sampled just about 19 beers. We tracked them all on untappd so if you're curious here is my profile. This quick dive into drinking led us to not read the instructions. We totally missed the fact that we were supposed to let the water get to roughly 160 and then maintain that temp after adding our grain. We brought both kettles to boil. We tossed the brown ale grain bag in the water and then realized what we had done. We let the red ale water cool down to about 170 before adding that grain bag in. 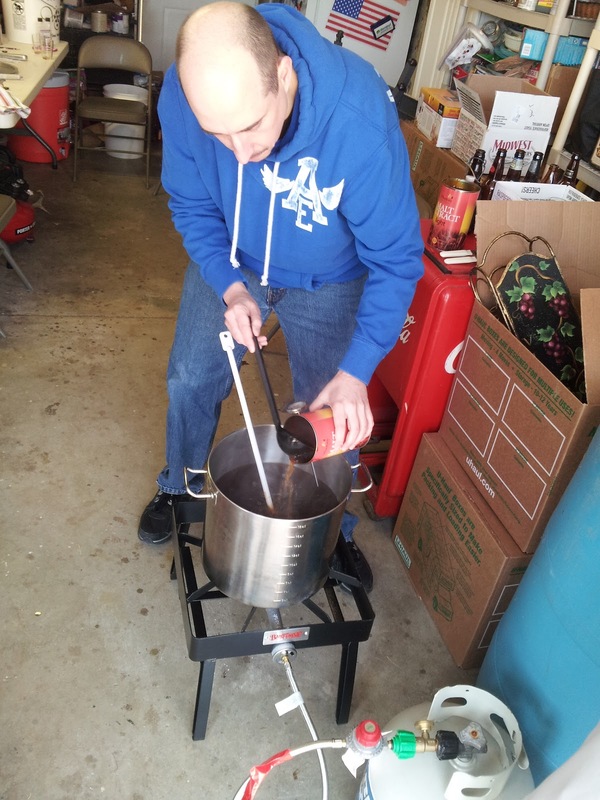 According to the instructions letting the grains steep at the 200+ temp means we will leach more tannins into the beer so we've jokingly decided to call the Brown an Imperial Brown. From there on everything went really well. 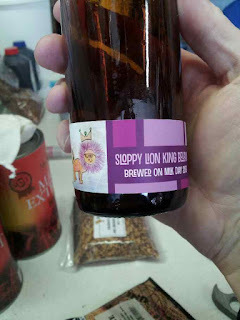 We put some of the Sloppy Lion King Belgian and some of the Knotty Octopus Alt Bier in the red ale during the boil. We do this to carry some of all of the old batches forward through every new batch. 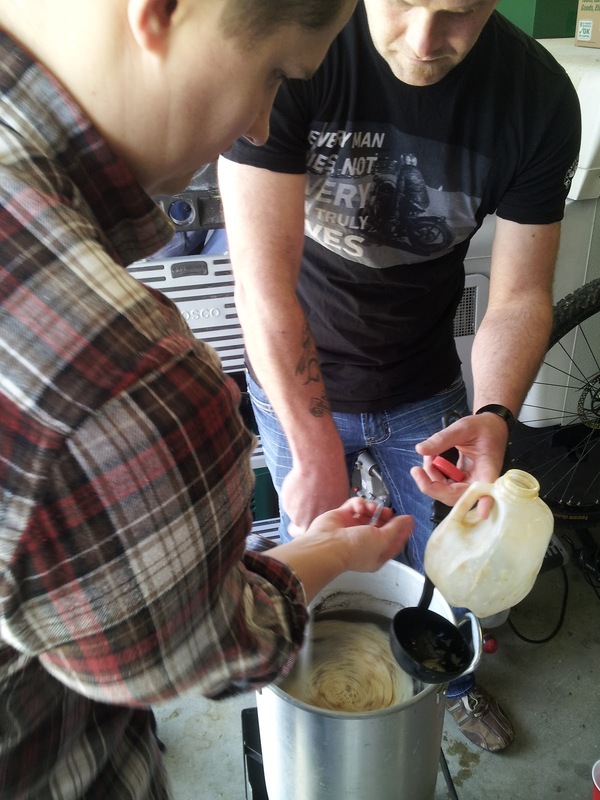 We had forgot to put the Alt into the Belgian's boil so we had to put a bit of each into this one so that none of the ancestry is lost. I'm not a huge fan of how the Alt came out so I put a bit more of the Belgian in than I did the Alt. Not only were we making beer but we also were making custom pizzas. We like to make sure everyone gets plenty of food while over for brew time so we had the bread machine working overtime all morning cranking out pizza dough. We then took turns rotating through the kitchen crafting our own custom pizzas with the smorgasbord of toppings everyone provided. It was a great meal and it really went well with the copious amounts of beer we were drinking. 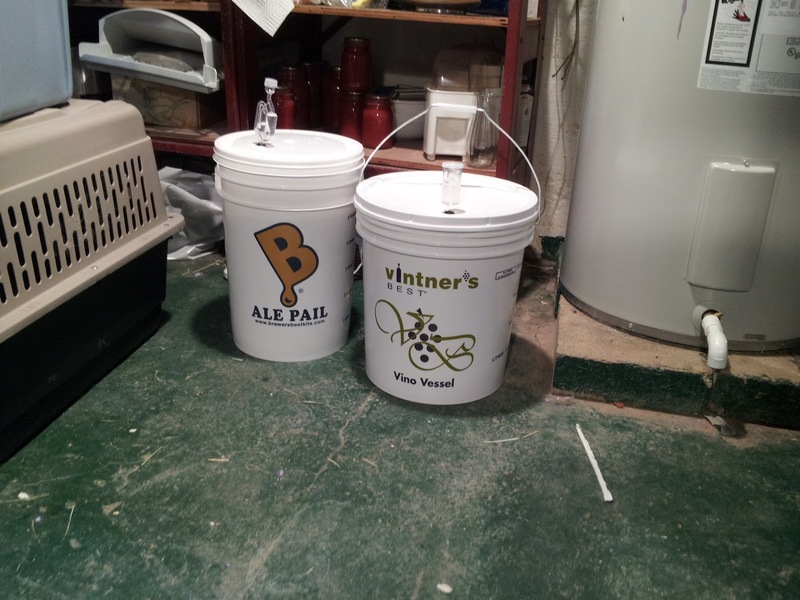 Eventually the brewing was done so we moved into the kitchen to transfer to the fermentation buckets. After siphoning the red ale into it's bucket I quickly sealed it up and put the air lock on the top. As I started to carry it away I was reminded that I still need to add enough water to reach the five gallon mark. The brown ale was topped off and they were able to read their original gravity (OG) without a problem and it seemed to be right where it was supposed to be. I had a ton of trouble reading the gauge on the red (too many bubbles in the brew) so I'm really not sure what the OG is on it. Hopefully it was in the right range. If not who knows what we will end up with? Finally I carted the buckets down to the basement where they get to sit for a bit before they will move to secondary. The red will be moving this Thursday evening right before I attend a home brewers social at a local pizza joint. That should be a fun and educational night. Sounds like you all have a lot of fun with these brewing parties. It's funny you talked about keeping the ancestory intact. We were talking about sourdough starter the other day and how womyn have passed it from one to another and it's traveled all over the world so the original starter that happened in maybe 500 is still going strong in someone's kitchen. In the brew you just made you've got brew from the earlier ones so if you use some of this new brew to put in the next one it will carry the 'genes' of the original ones you made. Have fun! Putting some of the red into the next batch is definitely the plan (unless something goes wrong with the red; i.e. it becomes infected). I hadn't really thought about the parallels to sourdough; that's a cool observation.